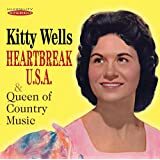 Kitty Wells will always be known as the Queen of Country Music. She was born Ellen Deason in Nashville, Tennessee in August of 1919. She opened the way for other female country singers and was a role model for many. She learned to play guitar at an early with country music being a big part of her childhood as her dad played the guitar and banjo. "It Wasn't God Who Made Honky Tonk Angels" was her first number one hit making her the first female to sell a million records. For an amazing 14 years in a row she was voted the nation's number one country female artist making her stand alone with such an achievement. She has racked up many awards over her illustrious career with just a few being, Country Music Assoc. Hall of Fame, NARAS Governor's Award for Outstanding Achievement in the Recording Industry, Academy of Country Music Pioneer Award, NARAS Grammy Lifetime Achievement Award, and The Music City News Living Legend Award. These country classic song lyrics are the property of the respective artist, authors and labels, they are intended solely for educational purposes and private study only. The chords provided are my interpretation and their accuracy is not guaranteed. Fats Domino lyrics are intended for your personal use only.